So this evening, with a head still slightly overrun with work thoughts, having never made pizza or having laid out a plan of attack, I muddled through this incredibly simple dough, whizzed up a quick pesto and warmed some butter and minced up scapes to throw in some chopped-up shrimp. I was completely disorganized. It still only took me 35 minutes. If you plan a bit better and work in a more organized manner, you’ll shave off another 10. And when it came to eating this pizza, Hades and I both stared at each other, fumbling for the words to say that this, here in our dining room, on this night, was the best thing we had ever eaten. Buttery, spicy, garlicky, sweet, melty. Wonderful. 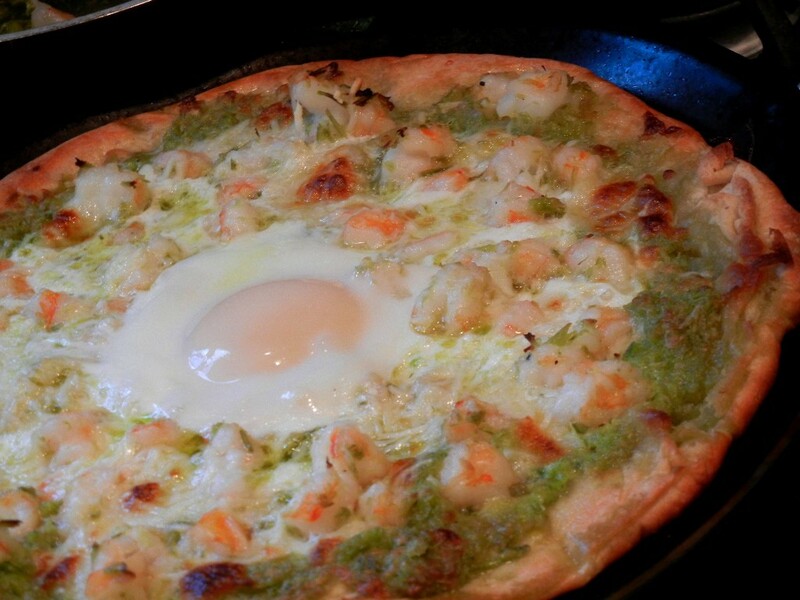 Best Garlic Scape and Prawn Pizza. Maybe ever. Heat the oven to 550 F or as high as yours will go. Whisk water and yeast together. 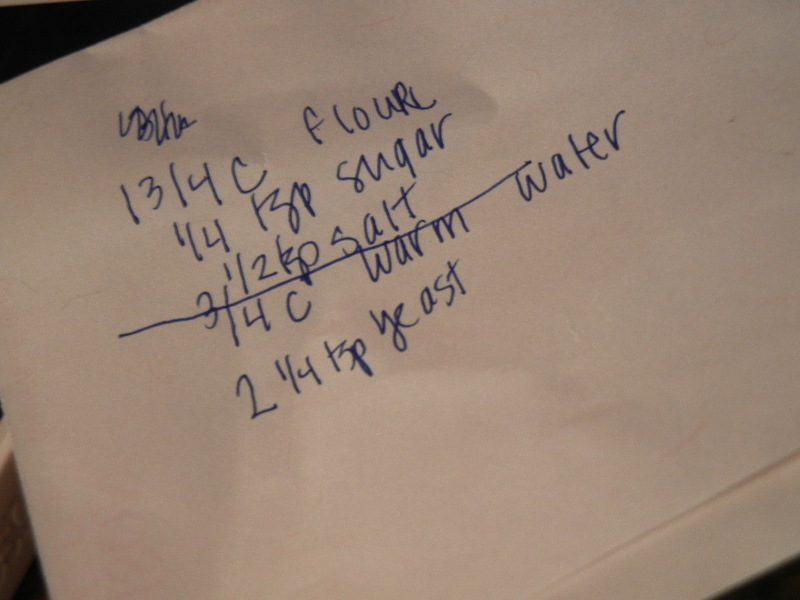 Measure and mix other dry ingredients. Add water and yeast (no need to let it bloom for any length of time). Mix well, fold dough into itself several times. Let sit until you are ready with the rest of your ingredients. In the bowl of a food processor add the garlic scapes and process until pureed. Remove one heaping tablespoon and set aside. Add in the pine nuts, cheese and process. Stream in the olive oil and season with salt. Puree until relatively smooth. Set aside. Heat the butter and the reserved heaping tablespoon of pureed scapes for five minutes over medium low heat. Season ever so slightly with salt. Remove from heat and add in the prawns. Set aside. Divide the dough in half and roll it out. This amount makes two about 10-inch pizzas. Lightly place them on a cast iron or heavy bottomed pan. Kate gave me these tortilla pans as a gift many months ago, covered with buttery biscuits, to season the pans. And they are perfect for this. Place it in your preheated oven and bake for two to three minutes, or until the dough starts to bubble. Take the pan out of the oven and flip over the crust. Top with two heaping tablespoons of the garlic pesto and two nice handfuls of the grated mozzarella. Place it back in the oven until the cheese is melted, but not bubbling, two to three minutes. Spread over half the chopped prawns mixture and the Parmesan and place in oven for another two minutes. Slide rack out from the oven with the pizza still on it, crack the egg on top. Return to the oven and bake, another four to five minutes or until the crust is almost browner than you think it needs to be and the egg has become opaque, but hasn’t fully set. Remove and let sit for two to three minutes, finish with the slightest bit more salt, then cut and devour. Playlist included Beginners by Slow Club. Pretty damn impressive, I’m intrigued w the scape pesto. Looks great! The egg is a nice touch..